Elena Narinskaya was awarded a Ph.D with the dissertation “Ephrem, a ‘Jewish’ Sage: A comparison of the Exegetical Writings of St Ephrem the Syrian and Jewish Traditions” (Durham University, 2007). 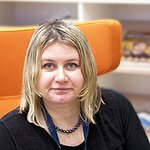 After that, Elena Narinskaya worked as Academic Researcher at the University of Wales (2008 – 2011), where she also completed a Licentiate in Divinity degree. There, she worked with a variety of methodologies including historical and literary criticism, as well as philosophical techniques. From 2012 to 2014, Elena Narinskaya did research in the area of Biblical Exegesis across the three monotheistic religions as Associate Researcher at St Stephen’s House in Oxford, UK. From 2015 to 2016 she was Research Fellow at the Centre for Interreligious Dialogue, Dublin City University, Mater Dei Institute, Ireland. From 2016 to 2017, Elena Narinskaya is Spalding Visiting Fellow in Comparative Religion at Clare Hall, Cambridge University. Since 2014, she is also Director of the Programme at the Women’s Ministries Initiative, St John the Baptist Fellowship, Oxford, UK. During her fellowship at the KHK, Elena Narinskaya will carry on her research in the field of interreligious studies in the context of the three Abrahamic religions, which takes into consideration different aspect of the God-human relationship and the questions of cooperation, synergy with God, as well as the questions of transcendence and immanence of God. M.A., Jewish-Christian Relations, Centre for Jewish-Chistian Relations, Cambridge, 2002.